Contemporary Electronics on Capp St. The musician/composers of SFSound chose a program for their July 16 concert that probed the interaction between solo instruments and electronics. Introduced and organized by clarinetist Matt Ingalls, the Friday night program returned to its former Capp St. home, San Francisco’s Community Music Center, with a lively group of six pieces. Three older works explored the beginnings of the age of electronic manipulation of sound, and three modern works sampled the fruit of this strange amalgam. These were not catchy tunes. These pieces had neither bounce nor beat. And motifs? Keys? Harmonic progressions? However, they did have rules of engagement, a curiously organic development for a machine hybrid. Kyle Bruckmann began the program in Christopher Burns’ The Mutiny of Rivers, paired with real-time electronic manipulation by Ernst Karel. The composer, an SFSound regular, was inspired by Italian composer Luigi Nono, and later performed a Nono piano piece to round out the first half of the program. Burns eschewed his preferred methods to combine digital sound files with an analog hands-on flexibility, writing specifically for the creative duo of Bruckmann and Karel. 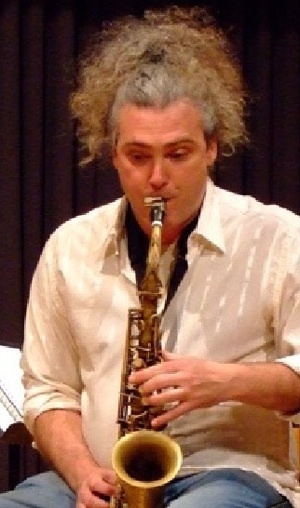 Often exploring the fringes of extended instrumental techniques, Bruckmann was surprisingly sonorous, trading his usual oboe for an English horn. His sound swelled, then expanded to two notes, a little too forthright for meditation. Electronic sounds entered, English horn notes distorted and filtered into a carnival fun-house mirror of richness turned to horror. The horn returned, but under electronic screeches and hisses. In an odd turn-around, the electronic effects became intriguing as the sound of double reed thinned. Then, a brutal wall of sound, a testing block of airplane engines, layered and barely intentional. Matt Ingalls next soloed in Denis Smalley’s Clarinet Threads, a lovely 1985 fusion of acoustic and taped work that fulfilled the promise of electronics. Clatters and grumbles partnered Ingalls saucy slide up a blue scale. The clarinet explored a single note, slowly swelling and dying to an electronic commentary, burbles and indistinct subvocalizations giving way to the high fluting of birdcalls. Percussive knocks and the thrum of invisible speeding “things” created a spatial context for the abrupt and alien language. And then a segue into natural forces, the intimacy of hugely miked ripples of water and winds on an empty plain, a distant clarinet howl. The birdcalls returned, now sounding alien in a severe soundscape. Ingalls’ clarinet worked its thaumaturgy, transforming gold into a grumble of diodes. Luigi Nono’s …sofferte onde serene… (serene waves suffered) was more subdued. Burns returned to play a piano festooned with cables, eliciting tone clusters and low rumbles. Blues melodies peeked out from the electronically enhanced bass reverberations and high echoes, a moment of lucidity among the special effects. This was a front-of-the-palate language, all tongue and teeth without any sighs or whispers. An intriguing piece on the second half was John Ingle’s improvisation in Per Bloland’s Quintet for solo saxophone and electronics. Ingle played an energetic sax line while cueing loops and altering pitches, pedaling with his feet as his fingers flew. His manic trills multiplied into a swarm of saxes, while his more percussive passages led electronic doppelgangers to flap and sadly honk. Cellist Monica Scott gave an appropriately angry reading of Mario Davidovsky’s abrasive Synchronisms #3, and Bruckmann and Karel returned for an electronic adaptation of Morton Feldman’s Oboe and Orchestra. The improbable range of a clarinet’s sounds made it a natural fit for Smalley’s electronic language, and a sax is able to populate a jungle of sound, but the other pairings were less successful. SFSound returns Friday, August 20 at 8 p.m. with a program of provocative chamber works at Old First Church, at 1751 Sacramento St in San Francisco. Details at www.sfsound.org. 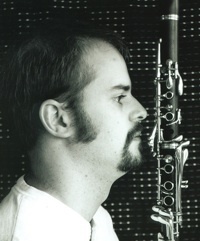 Photo top: clarinetist and composer Matt Ingalls. Photo bottom: sax player and SFSound regular John Ingle.